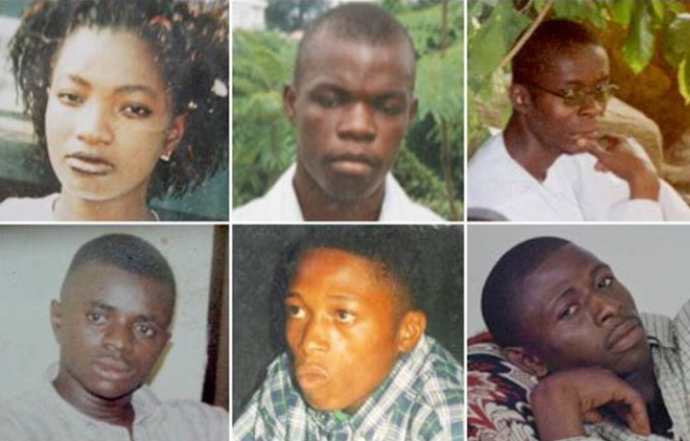 Apo six killing: Igbo youths protest against court ruling – Royal Times of Nigeria. The Igbo Youth Association in Apo district, Abuja on Fridaystaged a peaceful protest to FCT High Court and Ministry of Justice against the Apo six killings judgment. Chief Judge of the FCT, Justice Ishaq Bello, had sentenced two of the five accused policemen to death, while three others were discharged. They were charged over the killing of the traders on June 7, 2005, on suspicion that they were armed robbers. Spokespersons of the protesters, Chief Chemezie Ifeh and Chief Motimor Ihejirka said the main culprit was freed. Ihejirika said; “Danjuma Ibrahim, the DCP killed Ifeanyi Ozor and now he is free and he was the one who gave the order to the two junior officers to kill the remaining five. “We demand that if Danjuma would be free; let the two condemned officers be set free because they acted under the instruction of their superior. “We demand that this case should not be left to go away like this, the extra-judicial killing must stop. “We are submitting our letters to you and hope that you will act on it,’’. Hamza Tahir of the Legal Drafting Department of the Ministry of Justice promised to take their message to the minister. He assured; “The judgment has just been passed, and if your letters are submitted, we will look at it as well as the proceedings and the judgment. “The minister is committed to justice and will look at the issues you may raise in your letter, it can go to appeal and also get to the Supreme Court if the need be,”.